No matter what mix of settings I selected, Direct Adaptive Steering’s artificiality made driving the Infiniti Q50 feel like a video game. Depending on how you set a Q50 up, it can serve as a comfortable and quick all-weather performer, a modern and advanced technological tour de force, a fuel-efficient luxury car, or a fast and furious sports sedan. This variety, coupled with appealing design, ought to make the Q50 more popular than it is. If Infiniti addressed a handful of shortcomings, the Q50 would likely gain greater acceptance as an alternative to the more popular choices in the segment. For better than a decade, the Infiniti G35 and its G37 successor served as credible luxury sport sedan alternatives to the iconic BMW 3 Series. Not only were they terrific to drive, they looked different from everything else in the class, and in a good way. This distinctiveness, combined with genuine dynamic talent, created a loyal fan base and successfully enticed newcomers to the brand. And then, Infiniti pushed the “Q” button and blew a hole in its own hull. Big shoes are hard enough to fill without screwing around with a successful recipe, but change is inevitable, and so the old G37 sedan became an entry-level model called the Q40, while its successor went on sale as the Q50. Loaded with new technologies and wearing the latest in Infiniti fashion, the Q50 initially stumbled, but is now outselling the old car by a margin of 2 to 1. Available as a Q50 3.7 and a Q50 Hybrid with standard, Premium, or sport-tuned S trim, prices range from just over $38,000 for a basic model to more than $57,500 with all the factory-installed extras. 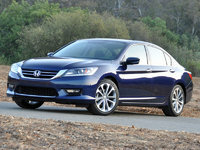 All-wheel drive (AWD) is available, as well as a variety of option packages and dealer-installed accessories. Also, it's worth noting that the Q50 Hybrid is both more powerful and more fuel-efficient than a standard Q50 3.7. My test car, painted Malbec Black, was a Q50S 3.7 equipped with rear-wheel drive (RWD) and every option, including the Performance Wheel and Tire Package. That latter upgrade supplies a set of staggered-width, forged aluminum, 19-inch aluminum wheels with a dark finish that sparkles blue in sunlight. The wheels look terrific, but not with the purple-hazed Malbec Black paint color. With bigger wheels, and in Q50S trim with its more aggressive front styling, this Infiniti looks just right. Without these attributes, the car looks a bit chubby and conservative. Given that BMW and Mercedes-Benz sell two or three times the number of 3 Series and C-Class models compared to the Q50, the Infiniti is somewhat of a rarity, and I noticed lots of Southern Californians checking the car out. Then again, it was painted Malbec Black, and there are lots of wineries in this part of the country. Inside, the Q50 is artfully detailed using quality materials. This is an intimate cabin, one producing a snug but not uncomfortable fit, and with a pleasing immediacy to the instrumentation and controls that makes the driver feel like an integrated part of the driving experience. 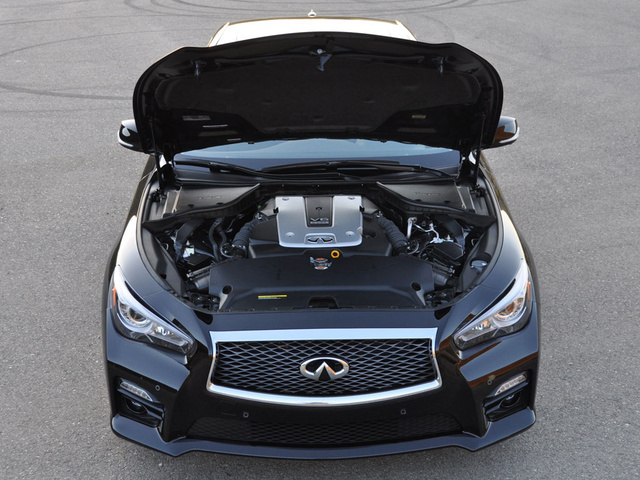 Thanks to a 3.7-liter V6 engine, power flowing to the Q50’s drive wheels is in plentiful supply. Rated to make 328 hp at a lofty 7,000 rpm and 269 lb-ft of torque at 5,200 rpm, this refined engine loves to rev while bellowing a distinctive note from oversized dual exhaust outlets. My test car was extra loud thanks to its optional Sport Muffler Kit, which adds nearly $700 to the price. Deft transmission calibration gives the Q50 significant thrust off the line, the 7-speed automatic transmission automatically adapting to different driving styles. Long, slender, magnesium paddle shifters are fixed to the steering column, making them a delight to use, especially for people who shuffle-steer down their favorite back roads. Downshift rev matching makes corner approach and entry smoother while generating an enthusiastic soundtrack. Perhaps I was too eager to explore the Q50’s performance potential. Although I kept the Infiniti Drive Mode selector turned to Normal the majority of the time, I averaged just 19.2 mpg during a week behind the wheel, landing short of the EPA’s official 23-mpg estimate for combined driving. Additional driving modes include Eco, Sport, Snow/Ice, and Personal, which allows the driver to specify certain powertrain characteristics. Yeah, I’d say that’s true. My test car was delivered with the steering calibrated to Sport feel and Quick response level. As a result, when driving down a suburban boulevard or local freeway, the Q50 seemed to shake and shiver like a chilly Chihuahua. Once I dialed it back to Normal feel and Normal response, the Q50 felt far more natural to drive. Still, when hustling the car down Mulholland Highway to the beach, no matter what mix of settings I selected, Direct Adaptive Steering’s artificiality made driving the Q50 feel like a video game. And for that reason, I’d recommend that driving enthusiasts who plan to exercise a Q50S 3.7 on a regular basis skip the Deluxe Touring Package. Unquestionably, the forged aluminum RAYS wheels and summer performance tires, working in concert with the Q50S trim’s upgraded brakes and sport-tuned suspension, add an extra level of capability to this car. If not for the steering, my test car would have flown across the Santa Monica Mountains with the same grace and tenacity of an Audi S4, BMW 335i, or Lexus IS 350 F Sport. To produce the most natural cornering feel and response, I shut the Q50’s Active Trace Technology off, which selectively applies the brakes to tighten a cornering line. The downside to the wheel/tire combo and the Q50S trim’s stiffer underpinnings is a rather taut city and highway ride quality. Plus, road noise is downright loud over imperfect pavement. That’s fine with me, though. True sport sedans are supposed to be highly communicative. Set up a Q50S with the right equipment, and it's a blast to drive. Another of my favorite things about the Infiniti Q50 is the driving position, which is enhanced by the Q50S model’s excellent sport seats. They place the driver forward, close to the steering wheel, controls, and windshield, making it feel as though the cockpit wraps around the driver and heightening the sense of immediacy associated with driving this car. Controls fall readily to hand, and once you’ve taken the time to set the car’s myriad electronic settings to your preferences, driving the Q50 is easy. It would be nice to have additional space for stashing stuff, especially a tray with a quick-charge USB port or a wireless charging pad for a smartphone, and it’s hard to understand how a Kia Forte offers a ventilated driver’s seat and a Chevy Spark comes with a Wi-Fi hotspot, yet this $50,000 Q50 doesn’t. 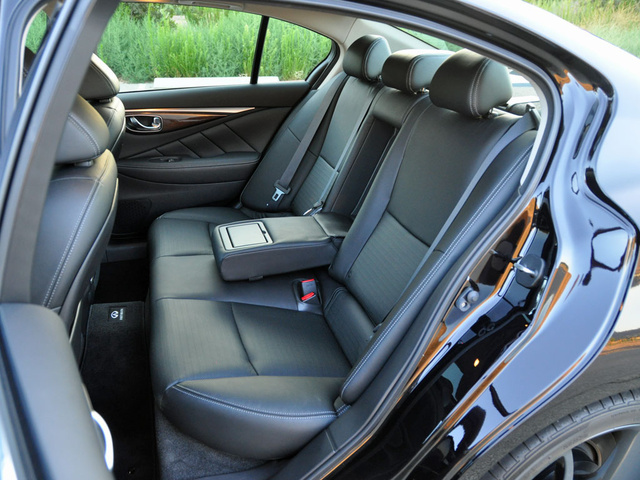 Rear-seat occupants will find thigh support satisfactory, thanks to a tall bottom cushion, but the reclined seatback angle might be too extreme for some people. Also, foot room is at a premium. Parents will want to note that I had a tough time using the Q50’s LATCH anchors. Normally, I ratchet my 4-year-old’s forward-facing safety seat down so tight that the seat base won’t wiggle a bit. That was impossible in the Q50S. Large outboard bolsters proved problematic, and when I switched lower strap orientation, I couldn’t get enough leverage to tighten it to the maximum degree. Tight trunk space might also preclude the Q50’s use as a family car. It measures 13.5 cubic feet, about the size of a typical compact sedan's, but the way the space is configured limits utility. 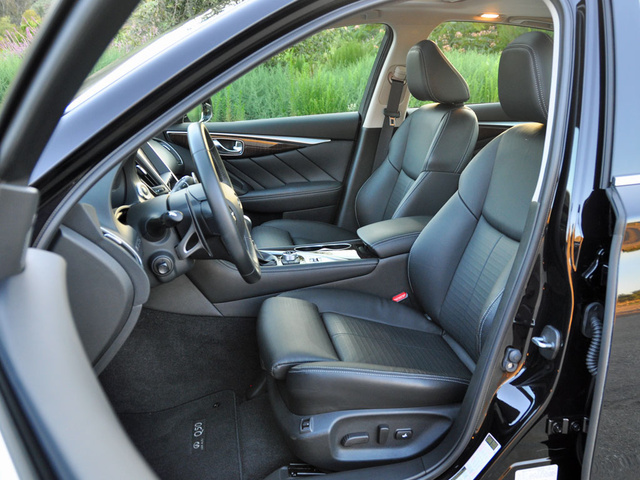 To get a 60/40-split folding rear seat that expands the Q50’s practicality, you need to pay extra. Normally, I do not advocate for technology in automobiles, especially the kind that distracts or attempts to second-guess a driver. Either I’m getting used the idea that change is inevitable, or Infiniti has done a great job of embedding technology without impinging upon the driving experience. In much the same way you might when you buy a new smartphone or tablet computer, you set up the Q50’s Infiniti InTouch, InTouch Apps, and InTuition systems to your preferences. Once you’ve accomplished that, for the most part, your interaction with the driver information, navigation, and infotainment screens is fairly limited. A “Radio” button on the dashboard calls up the radio display on the lower touchscreen, complete with oversize radio-station presets and crisp, large fonts and graphics. A knob adjusts volume, a rocker switch facilitates station tuning, and the dual-zone climate controls are arranged in vertical stacks on either side of the screen. Virtual buttons on top of the screen make it easy to switch music sources and stream your favorites from your smartphone. On the center console, a round control knob provides control of the upper navigation screen, which is also touch-sensitive. The Infiniti Drive Mode selector is next to it, providing quick access to the car’s different powertrain settings, and a button located on the steering wheel makes it easy for the driver to engage and disengage the Q50’s available driver-assist technologies. In fairly short order, after an initial acclimation period, I got used to how all this technology works, and for the most part it became second nature. My only real complaint? Fingerprints. Lots of ‘em. Upgrade a Q50 with the Technology Package, and this car comes with an exhaustive number of safety-related systems. Some are designed to warn the driver, and some are designed to take evasive action if the driver ignores the warning. Traditionally, I’ve been accepting of technology that warns, but not of technology that takes control. Given the number of false positives usually associated with these features, and the limitations when it comes to lighting, weather, and even road markings, I’d just as soon pass laws that make it harder to get, and to keep, a driver’s license. Still, there are times when Active Lane Control, Distance Control Assist, and Blind Spot Intervention systems are absolutely useful, especially in a city like Los Angeles, which is often gridlocked, and when traffic is flowing with people who shouldn’t be behind a steering wheel in the first place flying along at 80 mph. Infiniti makes it super simple to engage these features when you want them and to disengage them when you don’t. A button on the steering wheel turns these active driving assist systems on and off, and they work well when desired. It's too bad that to get the Technology Package, you must first get the Deluxe Touring Package, which means you have to get Direct Adaptive Steering. Oh well, life isn’t perfect. Should the Infiniti Q50 fail to prevent a collision, do note that the Q50 gets decent crash-test ratings. There is room for improvement, though. The NHTSA rating for the front passenger in a frontal-impact collision is just 3 stars, for example, and starting in 2016 this Infiniti’s Acceptable rating in the small overlap frontal-impact test conducted by the Insurance Institute for Highway Safety (IIHS) will no longer be good for a Top Safety Pick rating. Perhaps the most significant detriment to choosing an Infiniti Q50 is the car’s lackluster value equation. I’m not talking about how I totally missed the mark in terms of fuel economy, either. The base version of the Q50 costs more than $38,000. The only option is a power sunroof, not counting the extra-cost accessories that deplete your bank account of cash you really ought to be spending in order to upgrade to the Premium trim level. Let’s say you go that route. Now you’re spending almost $41,000, and leather seats still aren’t standard. And if you want a blind-spot warning system, you must get the Premium trim, then buy the pricey Technology Package, which is possible only if you’ve first purchased the Leather Seating Package, Navigation Package, and Technology Package. This effectively brings the price of a blind-spot warning system to $11,550. The Q50’s average depreciation rating from ALG doesn’t help to add value, and Infiniti’s warranty program isn’t appreciably better or worse than what the competition has to offer. Consumer Reports seems to think that it will cost you more to own the Q50 compared to other midsize luxury sport sedans. One thing you’re going to find when researching this car is that the Q50’s predicted reliability ratings are pretty dismal. Don’t worry too much about that. What you’re seeing is the typical owner response to new technology, and because Infiniti got right to work fixing complaints about the 2014 model, the automaker’s performance in the most recent J.D. Power Initial Quality Study soared. 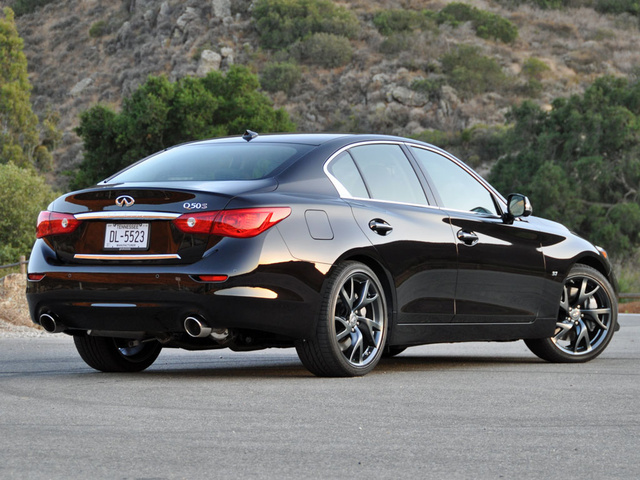 Mechanically, the Q50 is likely to be just as durable and dependable as the G37 and G35 before it. So that leaves the deal, doesn’t it? As I’m writing this, Infiniti is offering long-term, low-rate financing and attractive lease deals on the Q50 3.7 Premium. What I’d want, though, is the Q50S 3.7 with the Navigation Package and the Performance Wheel and Tire Package, painted Hagane Blue. Now that would make for a spectacular sports sedan. 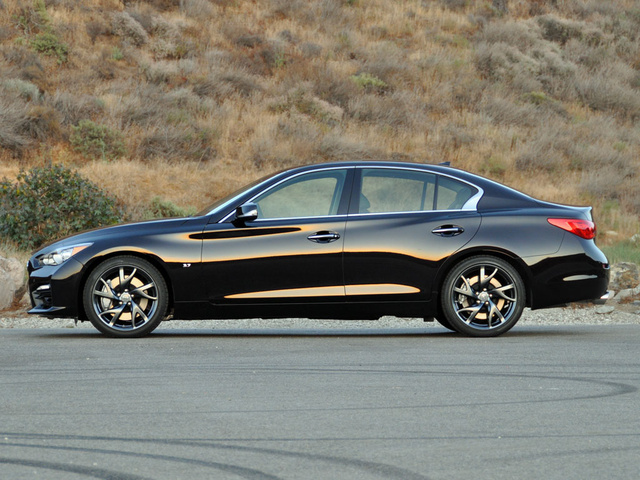 What's your take on the 2015 INFINITI Q50? 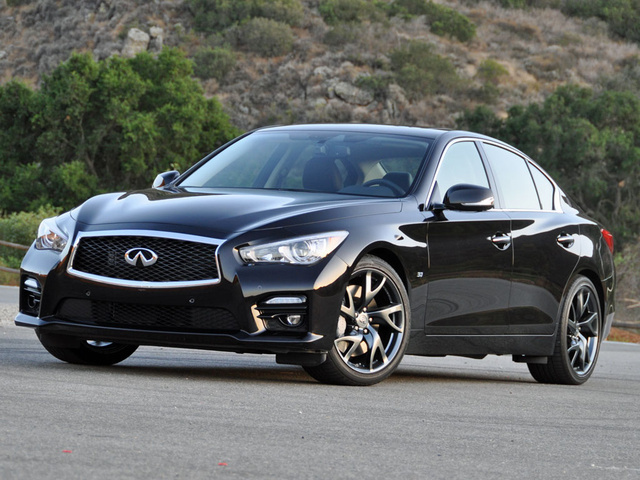 Users ranked 2015 INFINITI Q50 against other cars which they drove/owned. Each ranking was based on 9 categories. Here is the summary of top rankings. 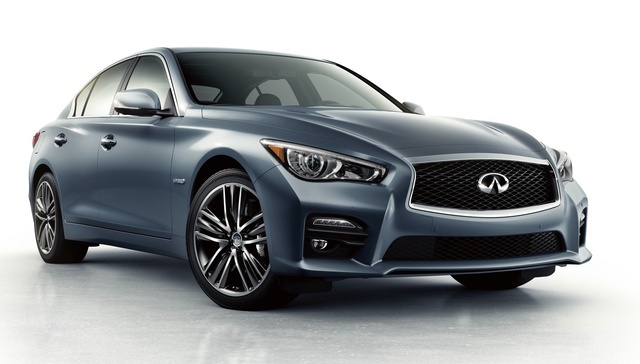 Have you driven a 2015 INFINITI Q50? cannot locate seller of vehicle lost title / registration out of town seller sent certified letter to resident no reply or pick up do not have number. I Had A Flat Tire. How Can I Reset The "warning"?